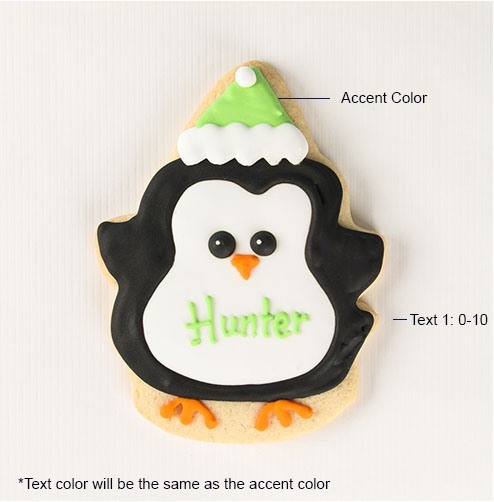 Penguin cookie with blue trim, saying Baby Boy. Very attractive and decorative. I ordered extra to taste prior to event, and it was good. Not too sweet. Tasted fresh. I have ordered these cookies twice, several years apart. Both times, they have arrived intact and fresh. They are also very attractive. This product exceeded my expectations. cookies are beautiful and delicious. 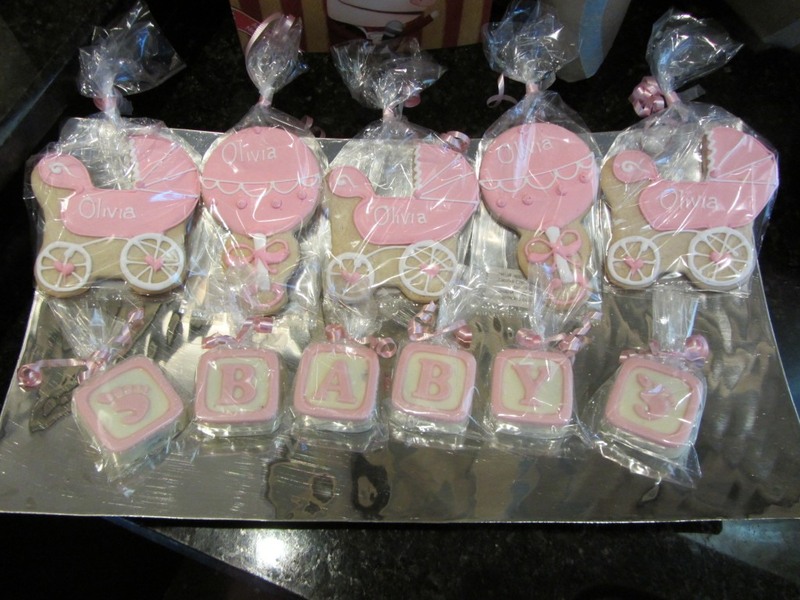 I used the cookies displayed in the cookies trays I prepared myself at my great nephew's baby shower. Made the trays very elegant looking. These arrived today beautifully wrapped and perfectly decorated for my daughters baby shower. I am very impressed with the size & quality and I know they will look beautiful on the table! I'm sure they'll be tasty too! Directions were followed to a "T" and shipping arrived ahead of schedule. Couldn't be more impressed!!! These were the perfect touch to the baby shower. They doubled as a centerpiece and party favor. Had a baby shower for twins boy/girl and these were perfect for the occasion. They arrived a few days before and were loved by everyone. It is a unique gift and very tasty. Will recommend to others. These were a wonderful addition to my baby shower! 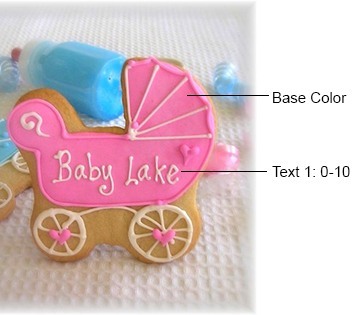 We personalized the carriage and rattle pink cookies with my baby-to-be's name and they were almost too cute to eat. But they are so delicious you can't help but eat them!! Had purchased other cookies twice before of another product which wasn't available, customer service rep suggested this cookie - did not disappoint - will order them again without a doubt - very satisfied - thank you!!!! They were wonderful and completed the table decorations as we put one on each plate. Very well done, cute and colorful and tasted great. I would buy them again, they were a great plus to the shower. The cookies shipped right before the baby shower! The presentation in the bags were nice. I really enjoyed the taste of the cookie. It has an almond taste to it. I ordered for my daughter-in-laws baby shower, it was a great hit, I have gotten lots of comments from people who have eaten the cookies, they loved them. Beau-coup is a great find. I was so so impressed with the cookies I ordered for my friend's shower. Not only were they beautiful and delicious, but perfectly boxed so that not one of them was broken. Thank you so much for paying attention to every detail! Everyone raved about how beautiful the cookies were - and they are quite tasty! [...] Adorable as favors. These were the cutest cookies ever! Even cuter in person if that is possible. Everyone loved them! I used the cookies as favors for a baby shower. They were so cute & delicious! I am happy I paid the extra cost to have them wrapped in cellophane & tied with ribbon. They arrived two days before the shower and were ready to go! Everyone loved them! 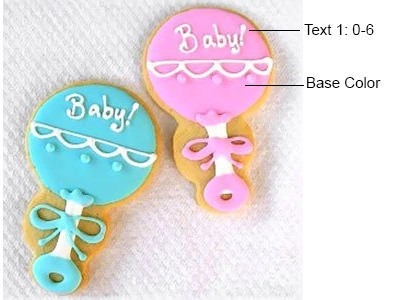 I ordered these cookies as favors for my daughter's baby shower, and they were the HIT of the party. Not only are they beautiful, they are as yummy as they look. They are also a very nice size (not small at all). I ordered the personalized bibs & strollers and also ordered the non-personalized bottles and onesies. My daughter loved them, and the guests couldn't stop talking about them. 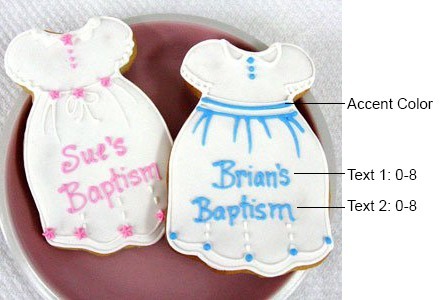 I will for sure be ordering these cookies for my grandson's christening, and i have already recommended them to a number of friends. What beautiful cookies! I received my order today [...]. From other reviews, I understand they are tasty too!. I just couldn't wait to let you know how impressed I was with each design. True artistry. 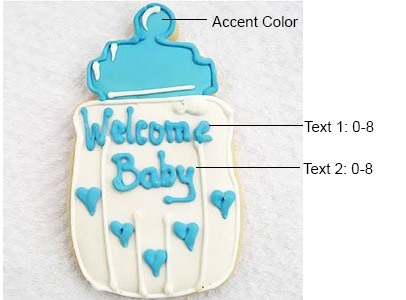 I ordered the custom designer baby shower cookies for my daughter in law's baby shower. They were absolutely adorable & being able to personalize them is so special! They were both delicious and very unique. I would highly recommend them! We ordered the airplane cookies in red/white and they [...]. They were paired on the centerpieces with party hats and brownie pops and were quite the hit of the party. We had 6 large airplanes along with other treats for a retired airline person who was celebrating their 75th b'day. What a hit! Not just for a baby shower. Hosted a baby shower [...]. They were a big hit with the guests and complemented the decorations. It made it extra special to have the items personalized with my nephew's name. Each cookie was beautifully hand decorated. A representative called me to make certain my order was understood, and it was executed perfectly. I ordered favors, which were wrapped with a ribbon, and others for a platter, which came in individual zip bags. My guests were amazed! And, the cookies were very tasty!!!! Thought this was ,[...] great buy and went over very well at a baby shower! These cookies are not only great looking but taste great too! In my baby shower, people hesitated to eat them becuase they look too pretty to eat! I had to ask my guests to take home as gifts! 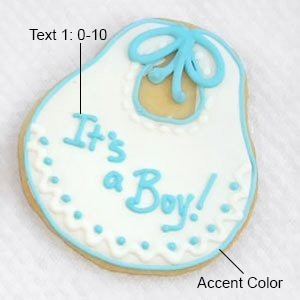 The only complain is that these cookies are a little pricy, but they totally worth it, if you want to add a personal touch to your baby shower. These we as yummy as they were cute! We were giving a baby shower for my daughter and were trying to find a favor that would not be something everyone would discard after the shower or collect dust. These were perfect, everyone loved them. The cookies were a big hit at the baby shower. We later enjoyed the extra ones that I bought as a snack with the tea made from the tea bags I also purchased. I was so happy to find your company on-line to order something unique for my daughter-in-law's baby shower. The only bad thing I found was choosing which cookies to order! They arrived on the day I wanted them,packaged beautifully. Thank you! These are just adorable - and delicious! I purchased these for my daughter-in-law's baby shower to use as favors. I ordered the "gift wrapped" variety, and they were just adorable. The orders I placed were executed perfectly - the personalization was so cute! The cookies themselves were delicious [...]. WELL DONE all the way around! Don't hesitate, these are great! A Must-Have for Your Baby Shower! 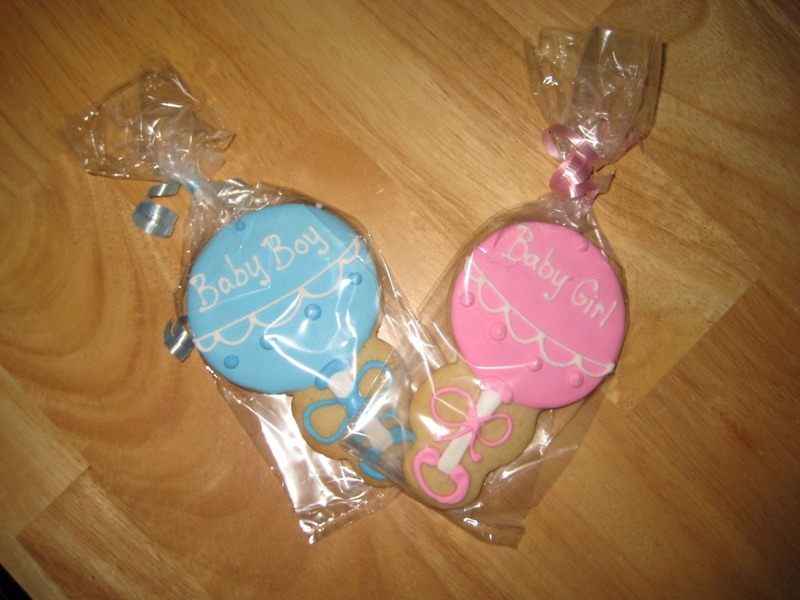 These beautiful Baby Shower Cookies really IMPRESSED and dressed up our party. Not only did they taste great, they looked SPECTACULAR! [...] I was truly impressed and would order again in a heartbeat! These cookies surpassed my expectations and made the perfect baby shower favors. They arrived beautifully wrapped, and were impeccably decorated. They had to be done by hand they were so pretty and detailed. They were also delicious, but almost too pretty to eat. I would order these again in a heartbeat!! 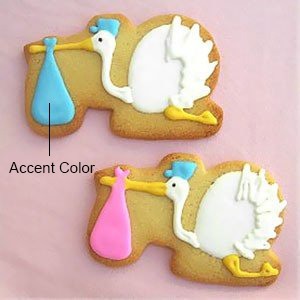 The traditional baby colors of these darling cookies added to the decor at our shower and was a wonderful take home for our guests. They loved them! 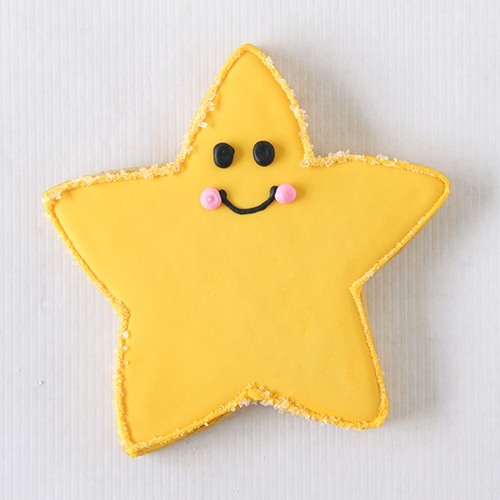 These cookies make perfect shower favors. Why give out useless favors that collect dust? Edible and pretty these are the way to go. I took these cookies to a baby shower and gave them away as favors. The guests couldn't stop raving and asked if they could take more than one! The cookies were just as beautiful as they were in the photo, tasted great and were packed nicely with decorative silver trays. I'd definitely order again. The cookies added a nice touch to the baby shower. The cookies tasted as good as they looked. Thank you for adding to the success of the shower. 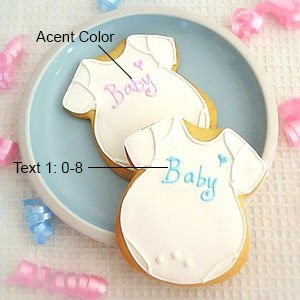 Q:You have stated, "the shelf life of these cookies is 3 weeks," so we,(the customer), should order according to the date of the baby shower? If this is the case, then I will be forced to freeze them. A:This item has a desired delivery date option. You can order whenever you like and set a delivery date for these cookies to be delivered. They will not be made until right before the delivery date. Q:Are the cookies certified kosher? A:These cookies are not certified kosher. Q:I just received my cookies and was wondering if I need to refrigerate them or can I leave them out with room temperature? Thanks. A:The shelf life for this item is 3 weeks. Please place them in a cool, dry place with no direct sunlight. No need to refrigerate these cookies. Q:Can i choose 6 pieces assorted cookies? Is it a must to be of the same design? A:The minimum of 6 cookies must be the same design. The shelf life for this item is 3 weeks. Please specify a delivery date to ensure freshness of the cookies for your event. 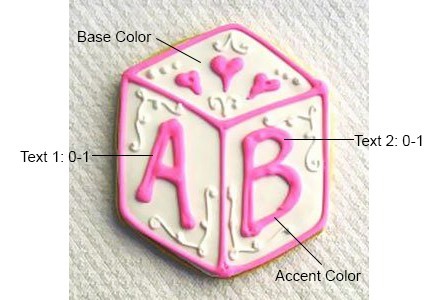 These beautifully custom designed cookies are perfect for baby showers and other baby celebrations. Made from a classic butter cookie recipe with a touch of almond, guests of all ages will love these cute and delectable treats. 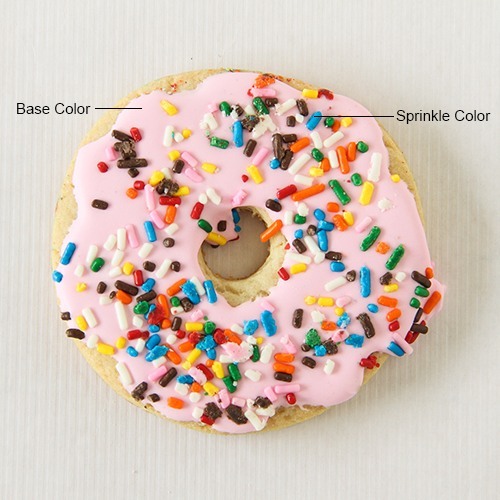 Our distinguished baker handcrafts each cookie with great care. Cookies come in a generous size, approximately 4" x 4", and are hand decorated with royal icing that dries into a sweet crunchy topping. Cookies are chewy on the inside. Shelf life of cookies is 3 weeks. Cookies are individually wrapped in a cello bag and tied with matching curling ribbon. You may also customize select designs with personalized text to mark the special occasion. 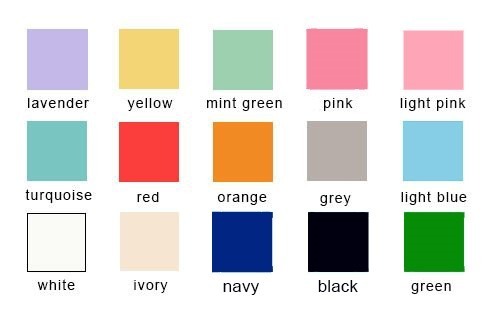 To match the color theme of your event, simply customize with the colors of your choice!